Another fabulous and sunny day here! Heading out to spend the day with my mom ... but before leaving, had to particpate in CAS-ual Fridays challenge today - birds. Since it's the same challenge as yesterday's SCS - Ways to Use it ... I'm going to enter this card for both challenges. Hope you like. Simple and easy card that didn't take very long to make. Stamped the image with Staz-On black - just love the crispness of this ink. Colored the image with Stampin' Write markers and outlined the stem with Certainly Celery. Added the polka-dot strip, ribbon and hearts punched from Real Red cardstock. The inside panel is Whisper White with a matching strip of polka-dot DP at the bottom and Daffodil Delight wrapped around (without the knot). SO cute! 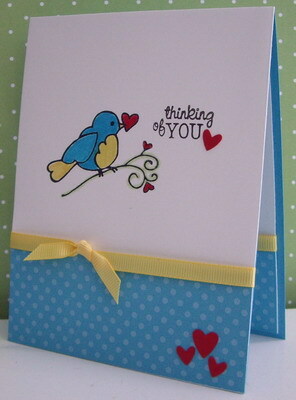 Love how you continued the card design into the inside of the card- really makes it special! Thanks for playing along with us at CAS-ual Fridays!